Arizona Rep. Kyrsten Sinema (D.), who is running for the U.S. Senate, spoke at a Texas Democratic event in 2011 where she repeatedly mocked her home state of Arizona for being "crazy." 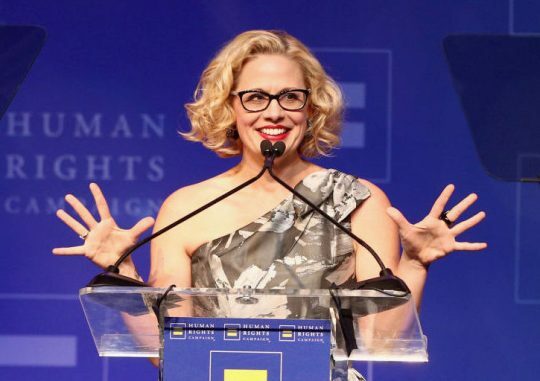 In video clips shared by the Reagan Battalion on Twitter, Sinema told the San Antonio Stonewall Democrats that people watching in "the past several years" had concluded Arizonans were crazy people. At the time, she served as a state senator in Arizona's 15th legislative district and had written a progressive how-to book titled Unite and Conquer: How to Build Coalitions That Win and Last. "Over the past several years, people would watch what has happened to Arizona be like, ‘Damn, those people are crazy. Is it something about the water?' No, the water is fine, we stole it from Colorado," Sinema said at the event. "When we grew up I remember in first grade we learned a song about Arizona," she added. "Arizona is the state of the five C's: cattle, copper, citrus, cotton, and climate. And those were the five things that our state historically made its money off of. But I would add a sixth C, it's called ‘crazy.'" As a longer segment of the speech shows, she argued the problem for Arizona was the Republicans. "There's something wrong with the people in public office in Arizona. People say ‘the Tea Party the Tea Party'—please, those people have been in charge for like 20 years in Arizona. They're called Republicans," she said. "Tea Party, Republicans—it's all the same thing: It's called crazy," she said. She described Arizona as a hot-bed of sexism and racism as exemplified by legislation about immigration, abortion, and other issues. She mocked Arizona's legislature and said Texas lawmakers were copying its conservative ideas. "The legislation that you see happening this year, the attacks on women, and women's right to make choices about their lives, their families, and their futures, that comes directly from Arizona state legislature," Sinema said. "The bills that you are seeing in the legislature this year, to restrict a woman's right to choose, to force her to listen to the heartbeat of the fetus and to look at a picture—I know that's in your legislature. It came from my legislature." "I want to talk to you about some of the things you can do to stop your state from becoming Arizona," she told them. Sinema also mocked former Arizona Gov. Jan Brewer (R.) as "not much of a reader."